Take a look at our 炒 (chǎo) character above. As we noted in the post last week, it is divided into a left hand and right hand side. There is a single component on the left, and two (sub) components joined to make another component on the right. The left hand component (which you also see identified as the ‘radical’) looks a little bit like a tiny man drawn using short, choppy strokes reminiscent of dancing flames. I call this character component ‘dancing fire-guy’ and he crops up as a component (and radical) in many, many Chinese characters having to do with fire, in general, and cooking methods in particular. At the ‘Gourmet 88’ restaurant, the names appear in English as well as Chinese characters. None of the dishes listed above specify being sautéed, or stir-fried (at least in English, anyway). 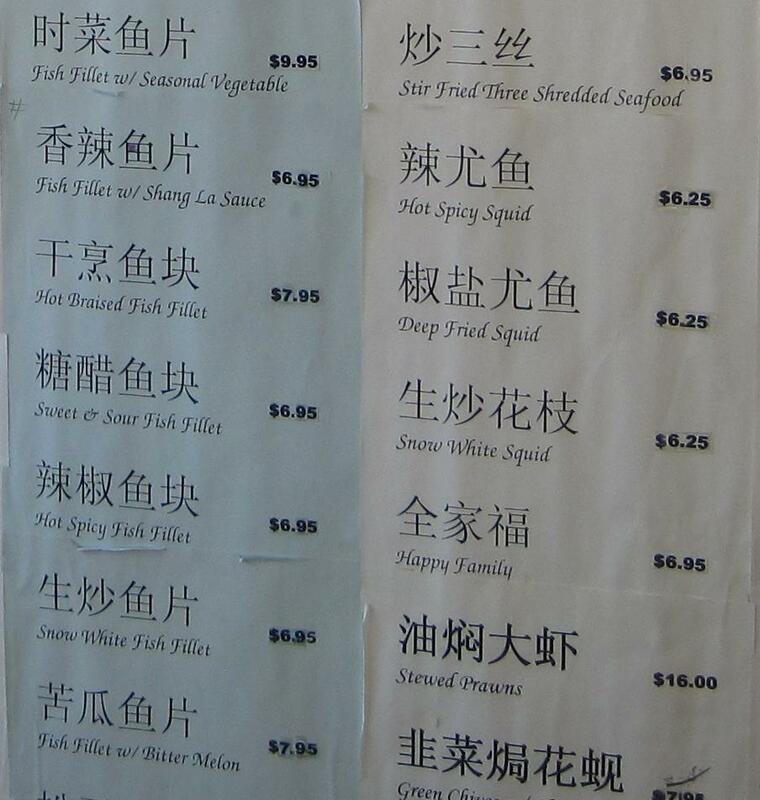 Which ones would you order if you felt like something stir-fried? As we will see, the 炒 (chǎo) character is often followed (and sometimes preceded) by characters identifying whatever it is that is being stir-fried. Occasionally, though, the character is preceded by another that modifies, or particularizes the stir-frying method. In Item #3 above, we see ‘溜炒’ (chǎoliū), pronounced something like ‘Lyoe-chow’… 溜 is usually translated as ‘slip’ or ‘slippery’ and a ‘slipper-fried’ dish is one is that is cooked in a thickened, often sticky sauce. Sometimes, you will actually see the word ‘slippery’ appearing in English names on Chinese menus. The more formal culinary term is 滑溜. Here are excerpts from the menus of two different restaurants, only one of which has the English translations supplied. It is easy to see the sautéed dishes where ‘stir-fried’ and ‘scrambled’ are specified, but how many stir-fried dishes are there in total? 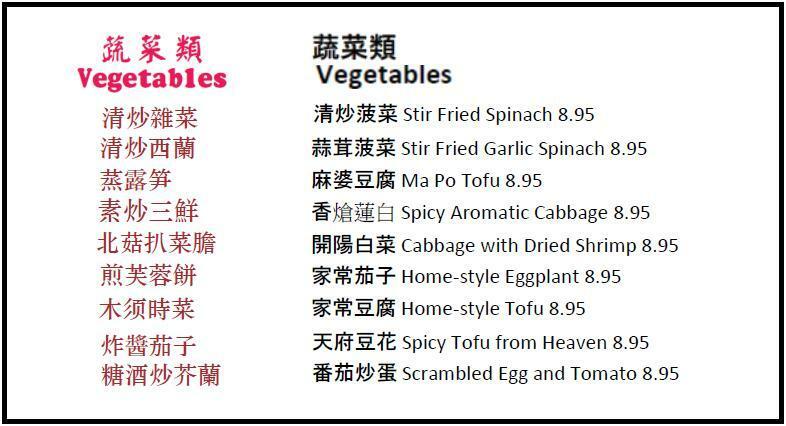 All of the dishes above are vegetable dishes, including those based on tofu but how many times does the character meaning vegetable occur? Can you find Bok Choy? Also… there are four places where a cooking method other than stir-frying is specified. You should be able to identify two of these by looking for our ‘dancing fire-guy’ component on the left side of the characters in question. Here is a ‘wall-board’ menu. One stir-fried dish is identified as such in the English translations. Can you find the other sir-fried dishes? The other two other occurrences of 炒 are followed by two characters specifying the main ingredient of the dishes in question. In each case, however, 炒 is preceded by 生 (sheng) which is a character found quite often on menus. It can mean: raw, alive, or newborn and often is used to emphasize freshness. In this context, it would appear to mean a plain method of stir-frying without a lot of ‘fancy’ sauces or other additions… hence the ‘snow-white’ result. Before we move on… can you find two occurrences of the character we learned for ‘spicy’ or ‘hot’ and another example of a cooking method identified by ‘dancing fire-guy’? 炒麵 (chǎomiàn) = ‘fried’ + (wheat) noodles. The first column above consists entirely of rice dishes and the character 飯 specifically refers to cooked rice. The second column consists of noodle dishes and all but the last three specify the type known as ‘miàn’. When stir-fried, the result is what almost everyone is familiar with as ‘Chow Mein’… that spelling reflects a Cantonese pronunciation whereas, in Mandarin, the word for this sort of noodle is pronounced something more like ‘Myen’. Here is another ‘wall-board’ menu that I have included as it will help you get accustomed to looking for handwritten versions of our 炒 character. It may take you a little longer, but you should be able to find it without too much difficulty. Do you see the character that follows? 炒麵 and 炒面 both mean ‘Chow mein’ and different menus will use one or the other. If you look, you can see that 面 is contained with the more complicated character, 麵, and, indeed, the one is the alternative version of the other. This raises a rather tricky little issue that we will have to look at some point so don’t worry too much about it now. “Chow Mein” literally translates to “fried noodles”. It was always with amusement when I worked at my parents shop and people ordered Chicken Chow Mein with rice. Yes, they would order Chicken fried noodles with rice. I would ask them if they wanted fried noodles in that and they would look at me like I was crazy. “No, on rice” was the usual answer. People seem to think that Chow Mein and “stir fry vegetables” are the same thing. They are not! I have even seen “Chop Suey Chow Mein” on the menu at a few older restaurants. Seems like a popular 1960s type of dish…like Egg Fu Yung.